Unless you have been living on Pluto for the past five years, you will know that hybrid cars are the biggest innovation in mainstream automotive development in the United States since the Model T Ford. A “hybrid” is a vehicle that has both an internal combustion engine and one or more electric motors that operate (in unison and/or independently) to propel the vehicle. Americans are migrating to hybrids in impressive numbers. In light of the economic slowdown, it is expected that purchases of 2009 hybrid cars will be brisk, even more so than in 2008. Thatâ€™s good for commuters, the planet and the automakers that have gone the hybrid route. Hybrids are the first mainstream move by the automotive companies to lessen the reliance of auto consumers on the old gas-driven varieties, which are high in harmful emissions and also represent a heavy reliance by the United States on foreign oil. As the term suggests, a hybrid is a combination, a compromise. Hybrid cars seek to significantly increase the mileage potential and reduce the emissions of a gas-powered car while overcoming the shortcomings of an electric car.Â To be useful to a significant proportion of users, cars must meet certain minimum requirements. Sure, a gasoline car meets all these requirements but, as we all know, they produce a relatively large amount of pollution and get rather poor gas mileage. Electric cars are practically pollution-free, but they get only 50 to 100 miles between charges. 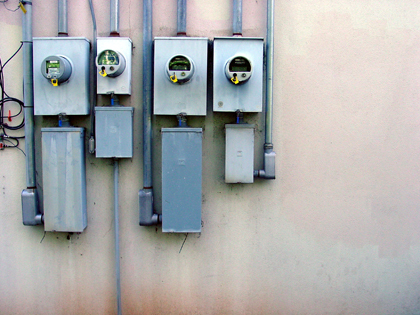 Recharging (refueling) an electric car is a notoriously slow overnight process. Enter the hybrid car. Automakers have succeeded in combining gas and electric elements in the same drivetrain to combine the benefits of both, and reduce the negatives of each type of locomotion. Here is a round-up (in alphabetical order) of the 2009 model hybrid cars available in the United States. Take your pick! Taking a look at these vehicles, it’s pretty clear why the Toyota Prius, Toyota Camry and Honda Civic hybrids are the most popular hybrid automobiles by far. It’s the gas mileage, stupid! Many of the other hybrid manufacturers don’t seem to get it, and keep cranking out hybrid after hybrid with mediocre gas mileage. Is it any wonder that no one wants to buy a car that is more expensive and more technologically complex when it doesn’t even provide a substantial increase in gas mileage? One last point. You’ll probably notice what seems like very low numbers for hybrids like the Chevy Tahoe. Increases from a very low number to something reasonable actually end up saving large amounts of gasoline overall though. Read why here. Some say the sheer size, features and options connected to the 2009 Cadillac Escalade Hybrid somewhat negates its gas/2 electric motor hybrid benefits. But that’s probably nit-picking. This is the only hybrid option on the market in the large luxury-SUV segment, so it definitely meets a need. 2008 sales proved it. This vehicle brings limited carbon footprint and fuel economy to the world of large Sports Utilities. It brags everything that opens and shuts, from Bluetooth to cup holder, and a lot of (pricey) optional extras too. The cabin is gorgeous, the ride dreamy, and it accommodates eight passengers easily. 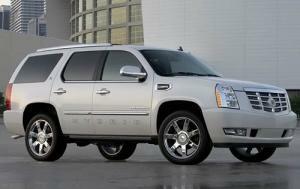 The 2009 Cadillac Escalade Hybrid is available in 2WD and 4WD. Here is GM’s answer to the Toyota Prius, which leads the way in mid-size hybrid sedans.Â Power in the Chevy Malibu hybrid is generated by the GM Hybrid Propulsion Electric System, combined with the ECOTEC 2.4L 4-cylinder hybrid engine. Critics say the mileage it gets is not much more than the gasoline version but auto buyers really like its styling and the fact that low emission reduce the carbon footprint. 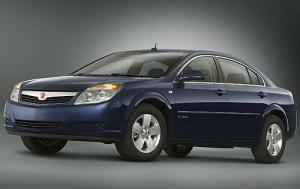 It’s affordable and at least now there is a hybrid Chevy sedan out there….even if Bluetooth doesn’t come as standard! GM has done a lot to make an attractive family/commuter car, and this translated into brisk sales in 2007/8, with further refinements in the 2009 edition. 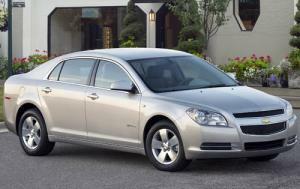 The 2009 Chevrolet Malibu Hybrid is an automatic, 4-speed FWD family car with with overdrive. This is a no-frills hybrid SUV (the frills come as optional extras and for those you will have to pay dearly). It’s a nicely styled 4-door vehicle with a comfortable interior seating eight. 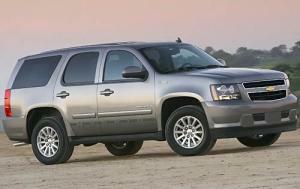 The Chevy Tahoe hybridÂ powered by a 6.0L 8 cylinder gas/electric drivetrain, offering solid capability and efficiency. It’s a basic automatic 4 Speed with overdrive. You can get it in 4WD or 2WD. Chevy’s hybrid SUV has not exactly taken the market by storm, but at least Chev now has a hybrid SUV option. 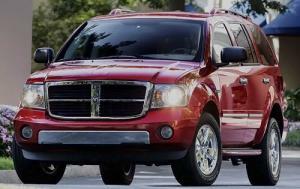 Fans are saying this Hemi-powered vehicle 5.7 liter SUV is an incredible vehicle with bundles of built-in features. Definitely a huge improvement on the 2008 model, they say. The new hybrid offers Hemi V8 power with V6-like fuel efficency. Unfortunately, all that hybrid hardware pushes the Aspen’s price up by $3,000 over the similarly equipped non-hybrid model. But the naysayers are saying that this is a rough diamond, that there are better, quicker HEV (hybrid electric vehicle) SUV’s out there with more for less……unless you need to tow a boat, in which case this is the perfect workhorse. 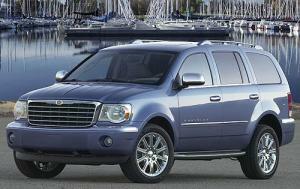 The 2009 Durango Hybrid is anything an SUV-lover wants it to be. It’s big on comfort and features,and delivered on the HEV promise. The two-mode system integrates a hybrid-electric drive system â€“ which reduces fuel consumption dramatically when town driving â€“ with the brute power of a 5.7L Hemi V8 for towing and highway driving. It’s a pretty-to-look-at, comfortable 4 door,Â and fun to drive,Â with the vehicle switching between electric motor and Hemi mode seamlessly. When you need the power (pulling a trailer, driving steep gradients, passing other cars) it’s there, and when you need to cruise and save fuel it switches over to the electric motor undetected. It gives a whole new meaning to “automatic”. Ford was the first to combine SUV flexibility with outstanding fuel economy and limited carbon footprint of a full hybrid. The Ford Escape Hybrid SUV meets the strick Super Ultra Low Emission Vehicle (SULEV II) and Advanced Technology Partial Zero Emissions Vehicle (AT-PZEV) standards. 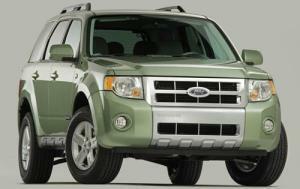 The Ford Escape Hybrid SUV is a 4 cylinder, 2.5 Liter automatic, CVT, available in 2WD and 4WD. It has a highly competitively-priced Base option (no frills) or a Limited option (with frills). There is terrific range of optional features available, ranging from Sirius Satellite radio to a voice-activated navigation system. Ford has really put itself out to set the benchmark against which toerh hybrid SUV makers should aspire. An earthy-looki V8, 6.0 Liter Hybrid from GMC, available in RWD and 4WD. 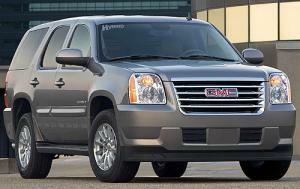 The GMC Yukon Hybrid SUV is not going to win any beauty competitions and it comes with quite a hefty price sticker too. But this is a powerful, no-nonsense machine without pretentions. It seats eight passengers and combines considerable fuel economy with the towing capacity of a traditional SUV. Please note thought that critics are saying folks would be better served by any of GM’s full-size crossovers that are nearly as efficient and much less pricey. 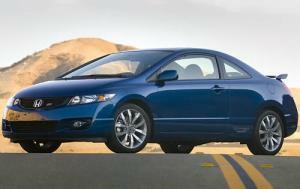 Here is Honda’s answer to the Toyota Prius, the leading commuter sedan on the US market today. It does not offer the lowest price in the range (far from it)Â but the features are good and it really is an effective 1.3 Liter, 4 cylinder, FWD hybrid. The 2009 Honda Civic Hybrid employs a small gasoline engine assisted by an electric motor that can, under certain low-speed situations, become the car’s sole powerplant. It certainly delivers extremely frugal city and highway fuel economy compared to its gasoline counterpart, while producing minimal greenhouse emissions. Unlike the Toyota Prius, which assumes a functional but futuristic appearance, the Civic Hybrid closely mirrors the popular Civic Sedan, with only a couple of minor exterior and interior variations that differentiate the two cars. 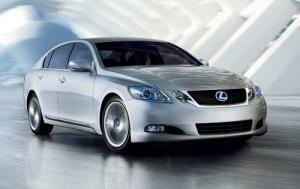 Lexus has done everything its power to bring luxury to the midsize hybrid sedan market. 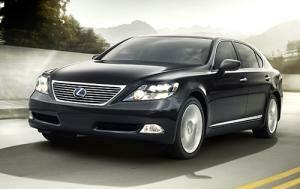 Motorists rave about the 2009 Lexus GS 450h, because they can forget they are in a hybrid. This model offers power, comfort and the knowledge that it is helping the environment to drive it. One minor anomaly is that it takes premium gas, but the positives evidently outweigh the negatives here. It’s a 4 door, RWD vehicle powered by a V6 motor (3.5 L). The hybrid delivers 292 HP. It is manufactured and assembled in Japan. Japan has done it with the 2009 Lexus LS 600h – produced a luxury hybrid that rides as well as the best comparable Beemers and Mercs. This is a step up on the other 2009 Lexus hybrid, namely the GS 450h, because it offers masses more power and an 8 speed gearbox with overdrive. Power is the watchword here, with V8, 5.0 L engine coming and standard. It costs a pretty penny, but then the value is extraordinary. This is my choice for a large car test drive in the hybrid market. Mazda has put all its hybrid eggs into this neat SUV with four variations: Touring AWD and FWD, and Grand Touring AWD and FWD. In true Mazda style this appears to be reliable, decent vehicle with all the important specs. very practical and bound to make many folk happy. It has a competitive price tag and neutral good looks. It boasts a 2.5L 4cyl gas/electric hybrid drivetrain and great color options in organic green, blue, gray and silver. Technically speaking, hybrid-wise, it is simple and innovative: The Tribute HEV, with the modified MZR gasoline engine, has been optimized to run on the Atkinson combustion cycle. The Atkinson cycle modifies the timing of the closing of the valves,Â letting the engine realize more efficiency. 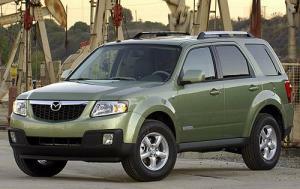 At the time of writing the 2009 Mazda Tribute Hybrid SUV had just had a limited launch in California — just 300 off the production line. Kelley Blue Book had not even listed it yet. The jury is still out on performance and impact, but this hybrid vehicle is undoubtedly long on great looks, specs and pedigree. 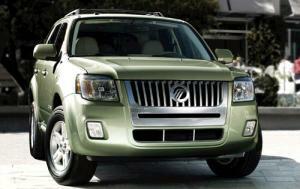 Mercury has made its mark with this vehicle in the crowded hybrid SUVÂ market and has introduced a number of new features in 2009.Â With an additional 24 hp, the 2009 Mercury Mariner Hybrid does an excellent impression of a lively conventionally powered compact SUV with superb gas mileage. The new braking system gets mixed reviews, as does the relatively ponderous handling capabilities. And it’s also a pricey hybrid SUV option. 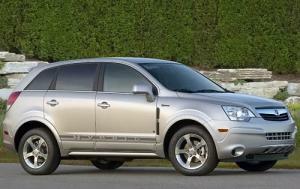 But no one can argue with Mercury fans who would not dream of getting any other hybrid SUV. The 2009 Mercury Mariner Hybrid SUV is available in 4WD and 2WD. hybrid CVT common to several vehicles in this hybrid class. 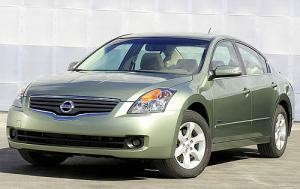 Nissan opted to use Toyota’s hybrid technology for the Altima. This is Saturn’s great-looking midsize hybrid car model, yielding good mileage from a optimal 4 cylinder, 2.4 Liter drivetrain. Saturn was late to enter the hybrid sedan market. At the time of writing Edmunds did not yet have specs available on the Aura, let alone a review, and availability was limited. The power plant is aÂ pretty standard GM type, with a 4 cylinder, 2.4 Liter power plant delivering 164 HP. But the attention to detail and Saturn’s distinctive emphasis on driver comfort and convenience makes this a real contender.The 2009 Saturn Aura Hybrid Sedan, with its reasonable price tag, is set to give popular midsize hybrids from Toyota, Chev, HondaÂ and Lexus a run for their money. As is usual for the Saturn marque, GM includes nearly all options on the hybrid model including sunroof and leather seats. This is a super-looking car and a comfortable ride. It plugs right into the American SUV psyche and delivers on its promises. Power from the 2.4L 4 cylinder engine is fine for everyday driving and results in excellent gas mileage you would expect of a successful hybrid SUV. The agressive styling including 17″ chrome alloy rims and great lines. The styling inside is sharp too. It’s too soon to say (it was first launched in 2008) whether this model is going to capture a significant share of the hybrid SUV market. The 2009 Toyota Camry Hybrid’s compelling duo of superior fuel economy and comfortable sedan attributes makes it a top choice for a midsize hybrid car.Â This is arguably the most fuel-efficient family sedan available, with a roomy interior and stronger acceleration than most regular four-cylinder sedans. This is a successful hybrid configuration: FWD, 4 cylinder, 2.4 Liter, Automatic, CVT. 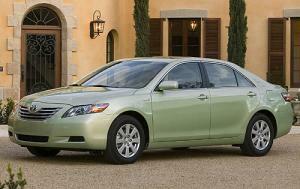 The 2009 Toyota Camry Hybrid sees no major changes from 2008 model. Beyond its powertrain and the eerie quiet that goes with its electric operation, the hybrid is virtually indistinguishable from a regular Camry. Actually the eerie quiet referred to here some drivers actually find disturbing. One does not expect a car to be dead silent at the traffic lights! But never fear, when quick acceleration is needed the Camry Hybrid delivers. This is the hybrid that really put midsize hybrid sedans on the map. It’s new age, simple and fun to drive. Drivers just love the button start, called the Smart Key System. No fumbling for keys. Just walk up, get in, and drive off! It’s powered by a 110 HP motor, 4 cylinders, 1.5 Liters. The gas savings are incredible and the emission levels are low, low, low. There are Standard, Base (hatchbacks) and Touring versions for every pocket and persuasion. 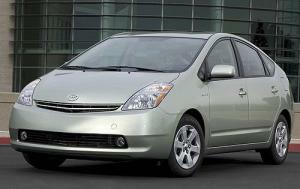 Toyota is planning to launch the “third generation” of Prius Hybrids soon. This is definitely my choice of midsize hybrids for a test drive. Just as Toyota defined the midsize hybrid sedan with the Prius, Toyota has pretty much sewn up the SUV hybrid market with the Toyota Highlander Hybrid. There are two version: Hybrid and Limited Hybrid versions depending on your power preferences. The 2009 Toyota Highlander Hybrid SUV offers comfort (some are calling it a Camry in an SUV) and terrific mileage for a vehicle this size. Fans are also saying GM and Ford are light years behind Toyota Hybrid SUV technology. 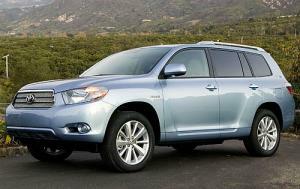 Powered by aÂ Â V6 engine, 3.3 Liter with automatic transmission and CVT, this is a 4W SUV that makes your mouth water. Like the Toyota Prius and Toyota Camry hybrids, this ride is quiet on the highway, handles flawlessly and has all the gadgets you could want. This is my top choice for a hybrid SUV test drive. I’ll have to hurry. These beauties are in demand…. Some of our readers are critical of hybrids and prefer high mileage diesel cars instead. If that’s you, then don’t miss our 2009 Diesel Car Roundup. HEVs are primarily propelled by an internal combustion engine, just like conventional vehicles. However, they also convert energy normally wasted during coasting and braking into electricity, which is stored in a battery until needed by the electric motor. I don’t think people realize the urgency of the situation. We are running out of gas! Myself, I would rather drive something fuel efficient than walk, given a choice. We have enough time if we act now, we don’t even have to suffer all that much, but if we stall and waffle we are going to end up worse off than third world nations, after all they never had anything to lose. The same goes with other energy consumption, if we work on switching to renewable resources, solar and wind, instead of coal, oil and natural gas, not only will we become self sufficient, but all this talk of Greenhouse Gas and Global Warming will go away. Previous post: Can lighting a match help the environment?